Man…is this brew ever a winner! I’m going to make an annual batch every single fall to help carry me through the grim and grey February and March mood swings. Motherwort is a healer. Well named as a Mother, she wants to nurture and strengthen you, to help you mellow out from anxiety and tension. Motherwort is a tonic for the heart – both the cardiovascular system as well as for heartbreak and emotional fluctuations. Does your heart flutter like a trapped bird in a cage? Motherwort wants to hold you close and safe to allow you to breathe deep and relax. Are you wracked by grief that you have swallowed and not dealt with? Motherwort might be hard on you at first, but it’s worth it. Like a strong mother, she won’t hold back from honesty. She’ll hold your hand and help you to find that hidden grief, acknowledge it, be vulnerable and heal. While motherwort holds you close and lets you cry it out, Lemon Balm is a light, little green fairy that flutters around you, giggling and giving you bubbles of hope. She’s a very helpful ally if you have anxiety or jangled nerves. Lemon balm has some sedative and analgesic qualities, helping with stress headaches, mild tummy upset, and menstrual cramping. I’m also fond of lemon balm because I always accidentally type it out as “Lemon Blam” and that makes me giggle. BLAM! Between these two plants, both sisters in the Mint family, they make a brew that is quite soothing to the savage beast. If you are up late and unable to sleep due to stress and anxiety, pouring a glass of this brew can be beneficial! (Alternately, a slug of whisky might just aggravate your emotional distress. I know this from experience! Ahem.) Ladyfolk, this is a perfect drink to choose during a tough moontime, with Motherwort offering some assistance to both menstruating and menopausal women. Regardless of what bits you have in your pants, Motherwort and Lemon Balm brew is the perfect nightcap to ease out of a traumatic day and into restful, healing sleep. Here’s the basic recipe and technique for one gallon of Motherwort and Lemon Balm Brew. I call this recipe a “brew” instead of “wine” or “mead” because it really depends on what you choose to use. Use 3-4 cups of sugar for a wine or 3-4 cups of honey for a mead. I used brown sugar in my recipe so that I could enjoy the depth of flavor that molasses lends, as well as nutritional and mineral benefits! Confused about any of these steps? 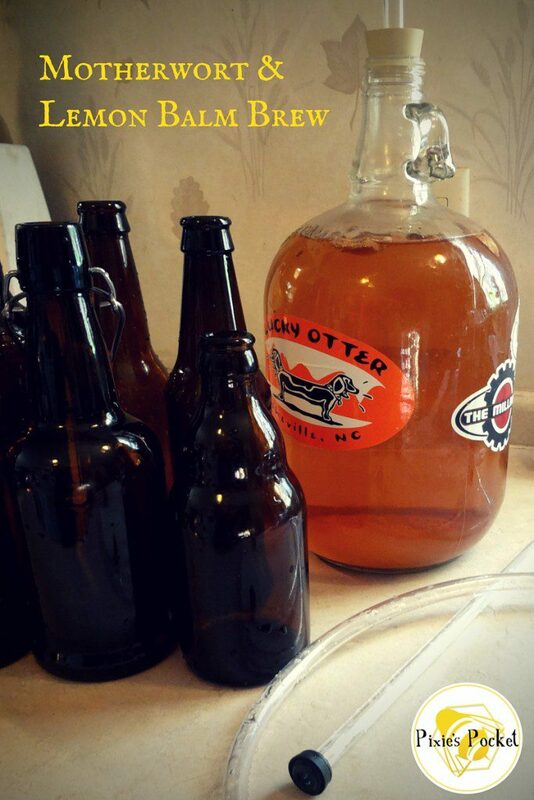 Check out my page on brewing one gallon meads and wines, or ask me for clarification! 1. Boil most of the water in a large pot. While that is happening, sanitize your gallon jug, funnel, strainer, and your airlock and bung. 2. Remove the pot from the heat. Crumple up all of the fresh herbs as you add them to the pot to bruise them and release their volatile oils. Cover the pot and let the tea steep for about 20-30 minutes. 3. Pour the sugar or honey into the warm tea and stir it all to dissolve. 4. Once the pot is cool enough to handle and the liquid safe to pour, strain the sweetened tea into the sanitized jug. Top the jug off with the rest of the filtered water to fill it up to the neck. Add the bung and airlock to the jug. Toss the leaves in your compost bin. 5. When the carboy is cool (probably a few hours later), sprinkle in the pinch of yeast and give the carboy a shake to mix it all up. Within a day or two, the jug should be bubbling happily. Let it sit and “work” for a month or two until the bubbles stop. 6. When the bubbles stop and the liquid is clear, it is time to take a taste and decide if you should bottle your brew or rack it and backsweeten it. 7. Bottle away! The brew mellows as it ages. I’ll be honest – my first taste of this brew left me feeling a little disappointed. The flavors of the lemon balm were *almost* there, but it was rather flat and bland overall. To give it more ZING, I racked the brew over to a new gallon jug along with a cup of sugar syrup to backsweeten. After a week or two of sitting in its new home, I tried another taste. This time, the flavor was much more pleasant! The sweetness helped the flavors meld together – the tannic flavors from the motherwort added a depth and richness on top of which the high notes of the lemon balm could float. If you aren’t keen on the flavor, try sweetening your brew. Want to tweak the recipe? Add the juice of a lemon or a few dried lemon or orange slices when you add the herbs to the boil. This will boost the lemon balm flavor and add a bit of vitamin C.
Add a handful of grains to give a more beer or braggot-like body to the brew. Oatstraw is another good, nutritious, mineral rich plant that could add a new aspect of healing to this brew…so to with nettles!